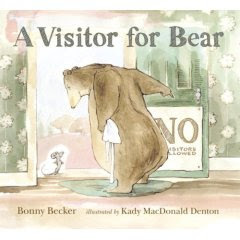 A Visitor for Bear by Bonny Becker, illustrated by Kady MacDonald Denton. 2008. Copy supplied by publisher, Candlewick. Bear is a loner. He even has a sign on his door: NO Visitors Allowed. So why does that annoying mouse keep stopping by? Bear is content being alone; But mouse is determined. Actually, mouse is borderline stalker. "One morning, Bear heard a tap, tap, tapping on his front door. When he opened his door, there was a mouse, small and gray and bright-eyed." Bear throws him out but mouse will not be ignored. He keeps coming back. Bear opens a cupboard to get a bowl and "there was the mouse! Small and gray and bright-eyed." Love Bear's language: "Begone"; "I am undone." I think I have to start saying "I am undone" more. How does it end? Does Bear end up opening himself up to the possibility of friendship? What do you think? Oh, and for the record, I am totally a Bear, content for the most part by myself. But I so don't have a No Visitors Allowed sign! The illustrations: love them! I love the details of Bear's house, with all the bee decorations. And Bear's apron. The shock on Bear's face, and Bear's body language, as the mouse keeps coming back. It sounds good. I'm going to check it out if I can find it in out library. I think you should say "I am undone" at least once a week in order to promote this budding habit. After a month or so, it should come naturally and then you'll never know how you lived without the phrase. I find it also helps to mock a phrase if you wish to use it more regularly. See also: my entire high school career making fun of things for a few weeks and then saying it in all seriousness the next few months (despite continuing to think the phrase was ridiculous).